Jesus went to Jerusalem. He went into the temple area. Jesus began to throw out the people that were buying and selling things there. Jesus turned over the tables that belonged to the people that were exchanging different kinds of money. And Jesus turned over the benches of those people that were selling doves. Jesus refused to allow any person to carry things through the temple area. Then Jesus taught the people. He said, "It is written in the Scriptures, 'My house will be called a house for prayer for all people.' 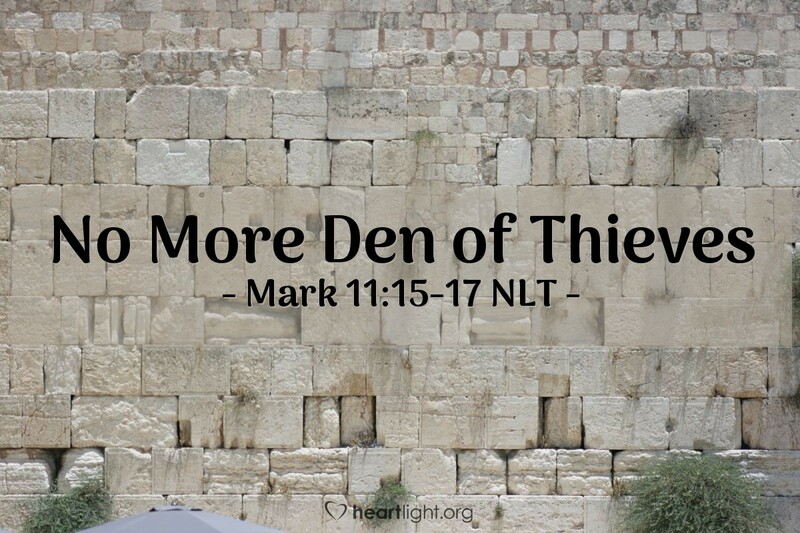 But you are changing God's house into a 'hiding place for thieves.'" Jesus invades the Temple to restore it to its purpose. This was to be a place of prayer. This place was to be open to all the nations. This place wasn't about making a profit off people seeking God. This place wasn't about merchandising the grace of God. While Jesus' actions were bold and shocking to those of his day, we have a tendency to let the distance in both time and culture soften the implications. If Jesus invades our hearts, our worship, our religious places and times, what sacred cows will he drive away? Are we open to other nations and cultures? Are we about being a place and people of prayer? How have we sold out our Savior and our worship of him to our over-commercialized culture? How have we let religious charlatans fleece God-seeking people? And if our bodies are God's temple, then what does this all mean for us? O God, my heavenly Father, help me see my sacred cows and let Jesus drive them out of my life. Humble me gently as you lovingly, but completely, remove the idols and vestiges of false religion that inhabit my heart. In Jesus' name I pray. Amen.